My favourite time of year is almost here! Our brief summer is on it's way out and my favourite season has almost arrived! Sweaters! Cuddling by the fire! Scoofling through crunchy leaves! The crock pot! Back-to-school time (even if I'm not going, I love it!) Autumn is the BEST and I can smell it in the air already. But just to send off summer in style we made one last strawberry pie. Adeline, her Nana and I all worked on it together as a surprise for David and it turned out just right. I love this fresh strawberry pie and it's the one and only time that I eat jello. I'll miss you, strawberry pie. This weekend was Thanksgiving here in Canada. I have so much to be thankful for, including amazing leftovers! This was our first year with a freedom loving, organic and ethically raised turkey and that was one TASTY bird. We had a big family dinner on Saturday with relatives coming from far and wide to celebrate with us, and have been enjoying the leftovers ever since. Stock is simmering right this second to make some turkey and barley soup for tomorrow. That's David's sandwich up there - you can tell because it has MUSTARD on it. Mustard on a turkey sandwich along with cranberry sauce? Ptooey, I say! But I make it for him because that's the way he likes it, and I love him and would let him have anything he wanted on his sandwich. David's contribution to Thanksgiving dinner was pie, and not just any pie but the quite famous and widely hyped "Crack Pie" which originally hails from the also quite famous and widely hyped Momofuko Milk Bar in New York. We had heard about this pie before, and when we saw the recipe in the latest issue of Bon Appetit I had to encourage David to make it. Well...David's not willing to say that it's the Emperor's New Clothes all over again, as he's never eaten the one from Milk Bar, but he did absolutely everything exactly as the recipe called for and it was...okay. It was good pie. It wasn't great pie. If that is really what Crack Pie is all about and nothing got lost in translating the recipe to the magazine, then I kind of feel sorry for New Yorkers if this is the best dessert in the city. I can think of lots of pies I'd rather eat. I found it barely sweet, lacking in any real defining flavour and more the texture of a bar cookie or square than a pie. I certainly didn't find it decadent or swoon-worthy, but it was a fine dessert. David's other pie - a classic lemon meringue - was way yummier. We had to try it though. For our Tet Trung Thu party I made Pho Ga (Chicken Noodle Soup) as I thought it would be something all the little (and big) people would like and I was right - it was really tasty! I used this recipe which is available on the Viet World Kitchen blog, but which I got from the book "Into the Vietnamese Kitchen" by Andrea Nguyen. David got me this cookbook last year while we waited to bring Adeline home and I've made many recipes from it and they all turned out just right. I do think Vietnamese restaurant food here in Canada is generally sweeter, so if you want it to taste more like it does at your favourite dinner spot, then add more sugar to taste. The directions for all the recipes are really clear and the end products always delicious, but I do wish there were more pictures! I had made Pho Bo (Beef Noodle Soup) before, but not Pho Ga, so I followed the directions exactly. When I tasted just the broth I thought that it was way way way too salty,but once the noodles, herbs, onions, bean sprouts and sliced chicken were added to the bowl it was just perfect and following the directions (which included such labour intensive steps as parboiling, draining and rinsing the chicken parts before making the stock) made for a lovely clear stock with a golden colour and heavenly aroma. Not as good as any of the chicken dishes we ate in Hanoi though. There is just something extra good about Vietnamese chicken! It was also a great recipe for a party, as I made the broth and the chicken the week before and froze them and then only had to boil rice noodles and lay out all the fixings so that each person could make their bowl to their own personal taste on the night of the event. A lot less stress than the sort of thing I used to cook before we had Adeline! David and Adeline helped by spending the afternoon while I was cooking out on an adventure, but I look forward to a few years in the future when Adeline can pull up a stool beside me at the kitchen counter and we can start cooking together! This is how I learned to cook and I have so many wonderful memories of being in the kitchen with my family. There are so many recipes I want to share with Adeline, from Viet classics to my Nana's schnitzel and perogies! My David is a romantic guy and a great cook. Yes, I'm a lucky, lucky woman. He's not a frequent cook, but whenever he makes us a meal you know it's going to be DELICIOUS and the kitchen is going to be clean when he's done and it's going to be way past your bedtime. David is a slow and careful cook who can follow any recipe and he has impressed many people with his signature dishes. This amazing White Chocolate Satin Tart has a shortbread crust, fresh berries and a white chocolate ganache. It's the dessert that he wooed me with on our very first Valentine's Day and it certainly worked on me! He made it recently for a potluck and since we had raspberries left over he decided to make another one just for us! Turns out that the day he made it we did have something to celebrate, as it was the day we got THE EMAIL. Of course we were both too excited to eat, but it was nice to have it waiting for us the next day once our stomachs had stopped flopping. This beautiful and decadent recipe is EASY, but you don't have to tell anyone. For the crust, combine flour and sugar. Cut in butter and vanilla until mixture resembles coarse crumbs. You can do this in the food processor if you want, but it's easy to do by hand. Form the pastry into a ball. Press on to bottom and about 1 inch up the sides of a 9 inch tart pan or springform pan. That's right - NO ROLLING OUT PASTRY! Chill the pastry for 30 minutes then bake at 425 degrees for 10 minutes and then cool. The pastry might get a slight golden hue, but don't let it brown. For the filling, melt white chocolate, cream and butter in the microwave on medium for 3 to 4 minutes, remove and stir until well blended or just put it all in a pot on the stove at medium until everything is melted and blended. Spread the raspberries evenly over the baked and cooled tart shell and then pour the chocolate mixture over evenly, making sure each raspberry has a silky white coating. Refrigerate until firm (about 2 hours) and then let stand at room temperature a little before slicing it into 10 to 12 servings. No garnish is necessary, but whipped cream, white chocolate curls and some reserved raspberries never hurt anyone. This summer there was heat a'plenty and almost no rain (both highly unusual for us here on the west coast) so I had a bumper crop of tomatoes. Red ones. Yellow ones. Paste tomatoes. Huge beefsteaks. Little green stripy ones. There are still a LOT of tomatoes finishing up their ripening down in the laundry room. We've been eating a lot of fresh salsa, bacon and tomato sandwiches and caprese salad, but we just couldn't keep up and I needed a way to store some of this deliciousness for the cold and drizzly days of winter. When I found this recipe for slow roasted tomatoes, I just knew that I'd found the way, so yesterday I was up early to get a pan in the oven by 8 because they take a full 12 hours to roast. Of course at a bleary 7 a.m. I didn't actually look at the recipe and just went by memory so I did remove the stem socket even though it told me not to. Didn't seem to matter, as after 12 hours at 200 degrees the skins just slipped off.I decided to give this batch a whiz in the food processor before bagging it for the freezer. Next time I think I'll roast just red or just yellow, as the orangey colour it ended up is not as appetizing as it could be. It doesn't really matter what it looks like, because it tastes amazing. It's so very rich and savoury, with a concentrated but mellow tomato flavour and I know it's going to bring a sparkle to lots of dinners this winter. Did I tell you we're getting a freezer? It's the kind that is almost as tall as me and looks like a refrigerator. It's very odd, but it's the freezer entering this house that seems to be the biggest symbol for me of a shift in our lives. Sure, we've got a crib box and mattress hanging around in our dining room and there are some meltingly tiny clothes on suitably tiny hangers in the closet, but it's the acquisition of this freezer that is really making me feel like a grown up. Are you sure I've never posted these before? I've never eaten a Pop-Tart, so I call them Pain au Chocolat or Chocolate Pastries. We often have these puff pastry and chocolate goodies in our freezer. They make a super decadent breakfast for a special occasion or a dessert good enough for company. Putting them together takes just minutes and they go straight from the freezer to the oven. Lay one sheet of thawed but very cold puff pastry out on the counter. Use a pizza wheel or knife to cut between the chocolate to make individual pastries. I usually do 8 because that's Pop-Tart size, but you can make them bigger or smaller. Put on a parchment lined sheet pan and freeze until hard. Then wrap tightly and keep in the freezer until ready to bake. Tomorrow is Canada Day and we'll be celebrating our great nation by painting the small upstairs bedroom. Not how many people choose get festive on their day off, but I'm looking forward to it. After that room then there is just ONE ROOM LEFT in our renovations. ONE! It started out with nine and soon it will be ONE! I'm pretty psyched about it as we've been at it for years (with lots of breaks, of course). Our fuel for the day will be a candy that truly makes me proud to be a Canadian, the Lowney's Cherry Blossom. These are a very nostalgic sweet treat for me. Neither the product nor the yellow box with the cherries has changed since I was little. They're not a very adult taste and if you didn't grow up with them you might not like them as they're on the edge of being painfully sweet, but I love them. As far as I know they are just a Canadian thing, although they may be a Canadian and British thing, I'm not sure. I do know that they're delicious and their drippy sugaryness makes me feel like I'm 5 again every time I eat one. Milk chocolate with both peanuts and coconut, cherry syrup, cherry cream and a maraschino cherry. Yum. I don't suggest you cut them in half before you eat them though - it guarantees a huge mess. Cherry Blossoms are not meant for sharing! I guess that's why David bought 5! For an early birthday present from my Mom I got some attachments for my stand mixer. Is it creepy that it was the grinder I was most excited about and that I've been thinking about sausage ever since I got it? On the weekend, David and I used a nice pork shoulder roast, onions, garlic, pasilla and ancho chile peppers, seasonings and red wine vinegar to make some super delicious chorizo. We love mexican food, so chorizo was the first thing I wanted to try and I'm so glad it turned out well. Now I've got big plans for grinding up all sorts of meats and making them into sausage. My chorizo I just threw together by thinking about what chorizo tastes like and remembering a conversation I had with a man from Mexico, but I think I'll actually look up some real recipes soon. Good turkey sausage from the fancy grocery store is so expensive, so I'm really looking forward to buying a turkey and making my own. It felt great knowing exactly what was in my sausage and knowing that all my ingredients were high quality. There were no fillers, no msg and just a touch of salt and best of all, it's super tasty. The texture was really good too - not as paste-like as commercial sausage is sometimes. And the actual act of grinding? Big big Sunday fun. Yes, other people had picnics in the park, but we happily re-enacted scenes from Sweeney Todd. Okay, creepy, I know. I had heard about the Vietnamese sandwich called banh mi for a couple of years now. Food bloggers wrote rapturously about it, but to be honest I couldn't understand how they could be THAT great. It's just a sandwich, right? On the day I spent by myself in Vancouver while David was at his conference I found myself wandering around Chinatown at lunch time and I saw the sign for "Kim Saigon Sandwiches" on Main and decided that eating a banh mi in the feels-like-spring sunshine on a bench at the Sun Yat Sen Garden would be the perfect break. I ordered the ham and pate sandwich and it was still warm and crusty after I'd made my short walk to the garden. At the first bite I finally understood and I felt an obsession growing. Why was it that good? I don't know, but it was amazing. The bread had a lot to do with it. The sandwich is on a french style baguette made with rice flour as well as wheat which makes it light and crunchy on the outside and so soft on the inside. Then there were the sweet/sour lightly pickled carrots and daikon, the cilantro, the onions and the condiments which included mayonnaise, something clear sprinkled on and what may have been Maggi seasoning sauce. It all just came together perfectly and I started making plans to move back to Vancouver immediately. I lived there for a few years, but I didn't know about banh mi then...what a fool I was. When David and I met up at the hotel in the late afternoon while he got ready to go to the the wining and dining portion of his event I went on and on about my sandwich, and he didn't really understand how it could be that good, so the next day we ended up there again and decided to sit and have lunch at the attached restaurant, the Golden Garden. David took one bite of his chicken banh mi and he understood what I'd been saying. We also shared a banh xeo, which is sort of a very crispy crepe filled with prawns, chicken, mung beans and sprouts that you break into pieces, wrap in lettuce leaves with some basil, cucumber and pickled carrot and daikon and dip in nuoc mam, that tasty Vietnamese dipping sauce that comes with many of the dishes. Oh so good. It was another dish I'd read about and wanted to try and it was exactly as delicious as I'd hoped it would be. Since moving to Vancouver is pretty unlikely to happen, we did the next best thing and went to a couple of Vietnamese grocery stores and stocked up on some ingredients that we just can't find here, including coffee making supplies. We had our first Vietnamese coffee in January and immediately went on a quest through our fairly large Chinatown and the big asian grocer for the supplies so we could make them at home, but couldn't find what we needed. In Vancouver we also got some other ingredients that I'd seen mentioned on my favourite Vietnamese food/cooking blog, Viet World Kitchen. I've always loved to eat Vietnamese food in restaurants, but I've just started cooking it at home, so this blog has really taught me a lot about both food and Viet culture. Tonight with my new ingredients I'm making a green papaya salad with prawns and I think on the weekend I'm going to tackle homemade pho using Andrea's recipe. I'm sure it won't replace the pho we enjoy out on a regular basis, but I know it will be good. And aren't the colours and images on the packaging so very beautiful? This little packet of five spice powder with the deer on it may never get used as I just like to look at it so much. They may not be the prettiest of cookies, but these White Chocolate Mocha Shortbread Hearts may just win you the undying affection of your coffee-loving Valentine. The recipe is just a basic shortbread which I tarted up with a few special things mixed in to give these cookies the not-too-sweet but rich and delicious taste of a classic coffee house drink. The idea came to me when I noticed I had an open bag of white chocolate chips leftover from Christmas. My choices were to 1) eat them or 2) invent a cookie, so I went with 2. Preheat oven to 300 degrees. Cream butter and sugar together. Mix in coffee powder and cocoa. Add cornstarch and flour and mix to combine. Stir in white chocolate chips and pull together to form into a ball. Squish flat, wrap in plastic and refrigerate 15-30 minutes. 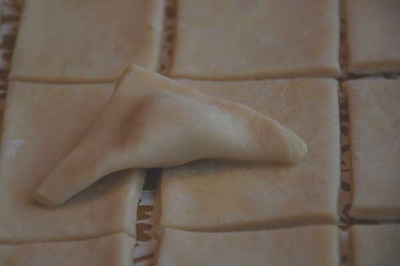 Unwrap, roll out to about 1/4 inch thick and cut your shapes, re-rolling scraps until you've used up all the dough. Bake on a parchment lined sheet pan for 18-20 minutes. There will be no browning, but the cookies will look matte and dry when they are done. Cool on a rack, sprinkle with icing sugar and enjoy. My summer rolls were so pretty I just had to stop and take their picture before we ate them. Rice paper wrappers, big juicy prawns, flavourful thai basil and cilantro, carrot ribbons, cucumber spears, spring onion slivers and rice vermicelli. So fresh and tasty. We eat these A LOT when it's hot, sometimes with prawns, sometimes with chicken or tofu or often just with vegetables. There's always a sweet/salty/sour dipping sauce to go with them and I get pretty obsessed with them sometimes. I can't wait until this summer when most of the vegetables will be coming out of my very own kitchen garden. I'm getting pretty excited about this whole growing food experiment. I hope I'm not disappointed. I know in the dead of winter when the winds are howling and the rain is falling that most people crave comfort foods like soups and stews and casseroles. Things that are hearty and starchy and warm. Oh I certainly love all those things, but they're not what I really crave when the world turns grey.When the weather is the worst what I want is bright foods with a ton of flavour. Ginger and garlic. Lemongrass and basil. Cilantro and chiles. Lemon and lime. Maybe it's because I miss traveling to warm climates the most when the days are shortest or maybe it just tastes like the promise of summer, but usually in my fridge in the winter you can find all those ingredients. This was my cutting board today as I got ready to marinate some lemongrass and garlic chicken and put together some Vietnamese summer rolls. The lemon should have been a lime, but I'm improvising with what I've got. But not really a recipe, since it's always pretty well made out of my head with the cheese I've got on hand. I cooked dinner for my family from the time I was 12, so I've got a lot of experience looking in the fridge and then whipping something up and I often don't use a recipe. But the people want a Mac 'n Cheese recipe, so they shall have one. This is how I made it on the weekend and it made...I don't know... a huge huge pot full. Portions can be cut down as needed. If you half everything you will still have a lot of Macaroni and Cheese, but that's a good thing, right? While you make the sauce, boil an entire box of macaroni (900 grams)according to ddirections on the box (including the direction that says to salt the water, it really doesn't make a difference). Make sure you use lots of water and stir occasionally as this much pasta really wants to stick to the pot and to itself. Drain when ready and put it back dry into the pot you cooked it in (but not on the heat or it will burn). Now to make the cheese sauce. In a saucepan over medium heat melt 1/2 cup of butter (is that a stick to you Americans? I never know). Once it is melted stir in 1/2 cup of all purpose flour and whisk on the heat for a minute or so. Don't let it brown. While whisking all the time, slowly stir in 6 cups of warmed milk (whatever kind you have). You might need a spoon to get in the "corners" of the pot as that's where the flour/butter (the roux) can clump up. Stirring, let the sauce come to a gentle simmer for just a short time, until it is thickened. 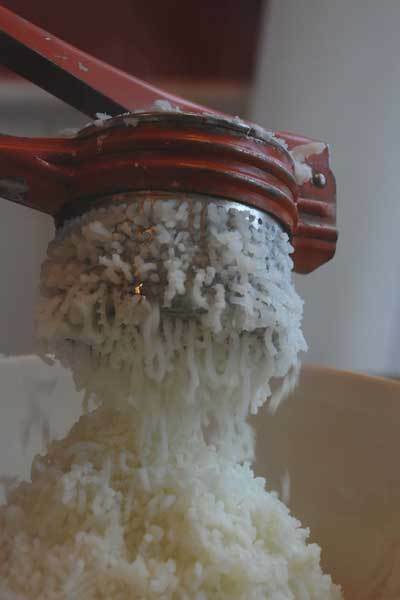 Off the heat add in as much grated cheese as it needs to make it taste "cheesy". Let's see...I think I probably added 3 cups of Cheddar, 1/2 a package of MacLaren's Cold Pack Cheddar Cheese (a Canadian thing), a cup of Asiago, 1/2 cup of parmesan and 1/2 cup of swiss because that's what was in the fridge. So about 5 - 6 cups of cheese in all? More won't hurt. All cheddar is fine, and any other cheese you like can go in there. For classic taste though, the majority of the cheese should be aged cheddar. Stir until all the cheese melts, either off the heat or on a low heat. At this point season with salt and pepper to taste. I also like a bit of nutmeg and small bloop of dijon mustard, but they're not necessary. Taste the sauce to make sure it's yummy. Does it need more seasoning? More cheese? Pour the cheese sauce over the drained pasta and stir well to combine. If your pasta has sat awhile and you want to eat right away you might need to warm the whole thing up a little, but keep the heat to medium low and stir constantly, as it will want to burn. I've always liked my Mac 'n Cheese saucy and oozy, but if you like it baked, just pop this into a greased casserole dish (or individual dishes) and top with bread crumbs mixed with parmesan and moistened with butter and bake at 350 until golden. From the top: caramel bar (a family recipe -rich and gooey) candied citrus peel (David's successful Christmas experiment, recipe he used from Martha Stewart here) cinnamon sticky buns (a Christmas morning tradition) cranberry white chocolate shortbread (everyone's favourite) and Aunt Bill's brown candy, from the recipe we found in the December Bon Appetit magazine - so good. So very good. Can't catch me, I'm the gingerbread man! The recipe for Nanaimo Bars comes from my Nanny. 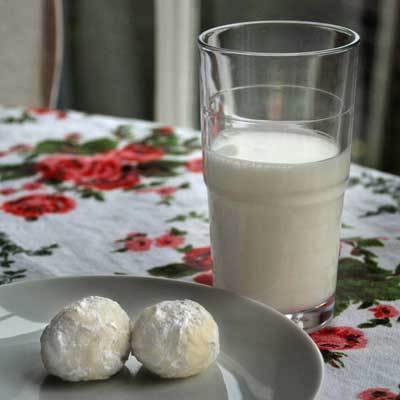 It was one of her specialties, and even though they're expensive and rather a pain to make, they truly are best homemade. The binder is her recipe book, which is the third thing I'd save in a fire after David and the cats. I love to look at her beautiful handwriting and remember opening this book and cooking with her. We always talked about organizing all the random slips of paper, cuttings from magazines and notes written on envelopes, but I'm glad we never got around to it. Base: Melt butter and chocolate together then cool slightly. Stir in vanilla and eggs. Add graham crumbs, sugar and coconut and mix well to combine. Press firmly into a lightly greased 9 by 13 pan and bake at 350 degrees for 16 to 20 minutes. Chill until completely cold before adding the filling. Filling: Combine butter, milk and custard powder. Using a hand mixer, blend in icing sugar and beat until smooth and fluffy. Spread evenly over cooled base and chill for 15 minutes. Glaze: Melt butter and chocolate until smooth, pour over and spread to edges. Note: The Nanaimo Bar in the photo is thicker than yours will be as I don't have a 9 by 13 pan and had to use a smaller one. Another Note: Scoring the chocolate before it is completely set will make the bars easier to cut once they are completely firmed up. David is actually from Nanaimo and he declares these the best Nanaimo Bars he's ever eaten. I asked him if where he's from they just call them "Bars" but he gave me that look and never answered. Sometimes I don't think it's safe to send David out shopping by himself. He was supposed to just be helping a friend buy a camera, but instead he came home with this ultra-shiny food processor for me and I didn't even have to wait until Christmas to enjoy it! If I'd been there I'm sure I would have talked him out of it as we've got lots of other things we should be spending our money on, but David knows it's something I've always wanted and I know I'll get a lot of use out of it. I'm kind of reluctant to use it, as it's just so nice and NEW and BRIGHT right now and I know it won't be for long once it's put to work. I've named her Maria after the robot in Metropolis. Certainly I'm not the only person who names my appliances, am I? When we were in Paris in 2002, we had a very memorable lunch at the Restaurant au Pot de Feu. The main dishes have long faded from memory (escargot? salad? pork medallions? soup? duck confit?) but the desserts have stuck with us. Mine was Ile Flottante (Floating Island), a sweet, soft, melting and marshmallowy meringue and custard confection and David`s was Pavé au Chocolat. Basically it`s a slab of chocolate truffle, and it was served floating in a pool of créme anglaise (a thin milky vanilla custard) and dolloped with some raspberry sauce. I knew I could recreate it when I got home and Ive been impressing people with this super easy recipe for years. Now it`s your turn to take TWO INGREDIENTS and TEN MINUTES and make an awesomely french dessert that will make people oh-la-la! The picture shows it with a homemade créme anglaise and an orange sauce, but it`s absolutely just as delicious and even prettier with a dollop of whipped cream and some fresh raspberries. 12 ounces very good quality dark chocolate, chopped extremely fine. Good chocolate is important! First, prepare your pan by taking a mini loaf pan and lining it with plastic wrap. Leave lots of overhang so you can wrap the whole thing up later. Finely chop chocolate by hand or in a food processor and place in a large glass or metal bowl and get a whisk ready. In a saucepan, bring cream just to the boil. Immediately pour cream over chocolate. Let sit a few seconds and then stir with the whisk until all the chocolate is melted and you have a velvety pool of liquid heaven. 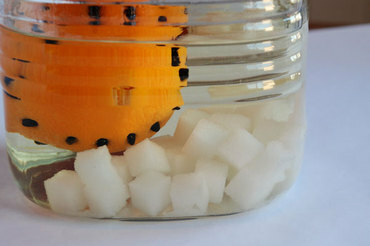 Don't incorporate too much air - just stir gently until it`s all melted. Hey! Yove just made ganache! Fight the urge to eat the whole thing with a spoon while it's still warm and pour chocolate mixture into the prepared pan. Place in the fridge until the top is set, then wrap well with the plastic wrap. Keep in fridge at least 4 hours or up to several days. To slice, unmold the pavé, unwrap and then dip a knife into hot water, wipe dry and slice with the hot knife. Let warm up for about 20 minutes before serving as it's not at its melty decadent best right out of the fridge. Garnish with whipped cream, fruit, a raspberry, strawberry or orange sauce, a dusting of powdered sugar or cocoa or anything else you can think of. I just realized that David's birthday had a really orange theme... a cocktail with orange soda, orange- infused french toast, bacon and fresh-squeezed orange juice for breakfast, and a chocolate dessert with an orange sauce to finish the evening. I even put on an orange tablecloth and wrapped his presents in an eye-popping combo of hot pink and orange! I wouldn't say David is predictable, but I know that anything with orange is going to make him happy, and that was my goal on his birthday. Into a cocktail shaker place alcohols, sugar, lemon juice and some ice cubes, shake until the outside of the shaker feels very cold. Pour in the soda and stir gently (if you shake it there will be an explosion - trust me on this). 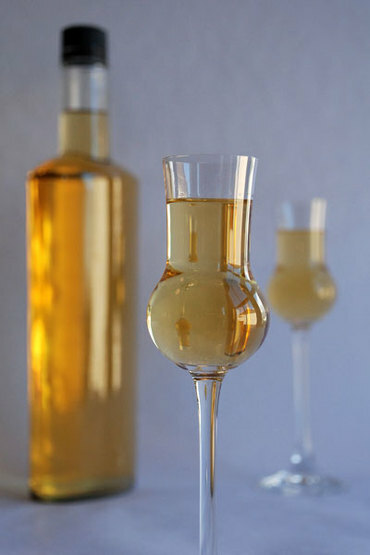 Strain the mixture gently into a large martini glass that has had the rim rubbed with lemon juice and dipped into sugar and has a teaspoon or two of grenadine in the bottom. Garnish with maraschino cherries and fruit jujubes. I just can't get enough of the local strawberries this season.They're some of the best I've eaten in years. Red red red inside and out and so very sweet. The hot summer after a cool and wet spring is obviously good for them! The freezer is full of juicy gems for future jams and sauces and smoothies so that we can taste a little bit of summer in the chilly drizzle of January and I'm eating as many fresh as I can . Aren't these the most valentine-y pictures ever? To me they look like bowls filled with shiny lacquered hearts. Is This Even a Recipe? If I could, I think I would eat this for dinner every single day of the summer. Or maybe alternate it with sweet corn. And then peaches for dessert. Mmmmm. That would be a good summer. It's not really a recipe, all you do is slice up some ripe tomatoes, removing the seeds if you want, then sprinkle on a little good olive oil, some balsamic vinegar, grind a little pepper and sprinkle with salt (my birthday fleur de sel works perfectly). Then crumble on some goat cheese and a mess of fresh basil. Eat. Yum. Bocconcini would be tasty too, but we always have goat cheese in the fridge, so it usually gets made with that. Is it odd that I always have a big log of goat cheese in my fridge? Canada Day this year coincided with the beginning of the local strawberry season. Every year when I taste these sweet ruby jewels I wonder why I ever bother with those pale cardboard strawberries from California. The season is so short here, so we'll be enjoying a lot of strawberries over the next few weeks. David decided to celebrate our great country and how lucky we are to be Canadian by attempting his first Pavlova. He thought the red and white colour scheme was perfect for the day and that it would really showcase our delicious berries. It was totally yummy and pretty as a picture, but you won't be getting the recipe. Meringue is a fickle mistress, especially on a hot and humid day, and this one was not the texture you'd expect. But tasty? Hoo yeah. Smoothie...frozen in a popsicle mold...a smoothsicle...brilliant! Smoothies! Yes, I know I could have a smoothie anytime I wanted, but it just seems like a summer thing to me. Here's our favourite classic smoothie recipe, using some frozen fruit for convenience, a good creamy texture and a nice degree of coldness without watering it down with lots of ice. Into a blender place in this order: the juice of 1 or 2 oranges, 1 cup low fat or non fat plain yogurt, a squeeze of honey or other sweetener (optional), 2 small or 1 large banana, 1/2 to 1 cup each of frozen strawberries and blueberries (I freeze my own when the organic local ones are in season) and 6 ice cubes. Put on the lid. Whizz. Drink. Yum. The recipe is my own, adapted from some I found online. I wanted something that only made 12, but you can easily double this if you've got a crowd. They are extremely pretty and have a good texture, but to be honest they don't taste of much, so make sure you use a frosting you really love. 1) Preheat the oven to 350 degrees and line a 12 cup muffin pan with large or giant sized cupcake papers. 2) Stir together all the dry ingredients. With a hand mixer on low, mix together all the wet ingredients. BE CAREFUL OF SPLASHING! The amount of food colour in this batter will ruin clothes, paint jobs, grout, etc. 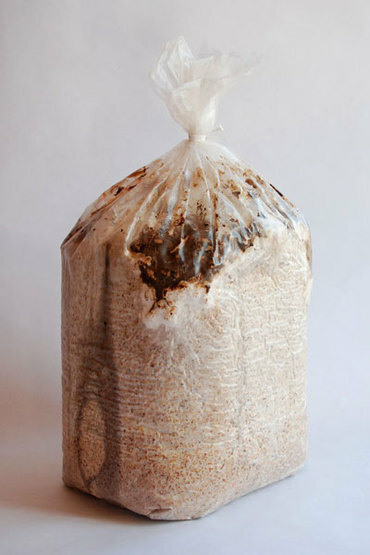 3) Gently combine wet and dry ingredients. The batter is a bit weird looking - kind of thin, oily and sticky - but they turn out just right. 4) Divide among 12 muffin cups. 5) Bake for 20 - 23 minutes. You can do the toothpick test if you want. I always just know that my oven takes the longest time called for in any recipe. 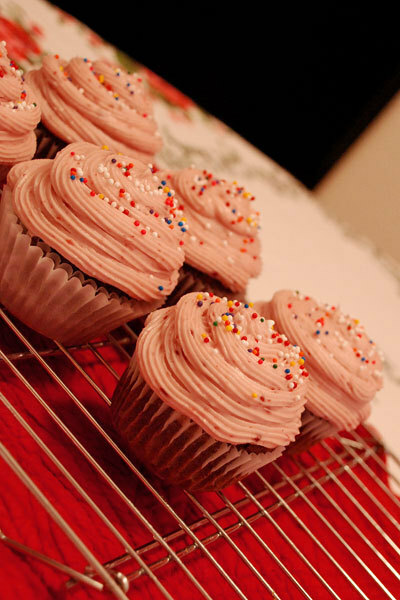 6) Remove from the oven, take the cupcakes out of the pan and cool completely before frosting. 2) Continue beating while slowly incorporating the icing sugar. 3) Stir in the vanilla. 4) Can be spread right on cooled cupcakes, or let chill in the fridge for about 30 minutes before attempting to use a piping bag. We eat healthy. Okay, MOST of the time we eat healthy. Veggies. Fruit. Lean protein. Whole grains. Lots and lots of salads. That sort of thing. But when I just MUST HAVE something evilly wonderful, it's got to be Hawkins Cheezies. Cheezies are a Canadian thing, and I think they're the most perfect salty/crunchy snack out there. They got me through 4 years of university and are still necessary to any process requiring a lot of inspiration. NO, they are not like the cheese-flavoured snack foods from your country. They're just NOT. I've eaten your so-called cheesy snacks and they just aren't cheezies and they don't compare. Yes, they're fried, but they also have the goodness of really real cheddar cheese, so that has to count for something, right? And when you find the perfect ultra-fresh bag full of little crunchy ones it's a truly amazing snack experience. Cheezie lovers are divided amongst those who like the bags with more huge pieces and those who like the bags with lots of little pieces. Yet another reason that David and were meant for each other is that he likes the big ones and I like the tiny ones so it all works out just right! Umm...yeah....this was supposed to be a photograph of a bowl of delicious cheezies, but we just had to eat them. You're lucky I stopped sniffing the bag long enough to take a picture of it... 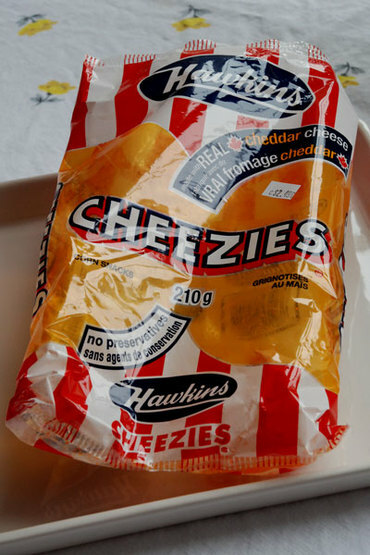 If the nice folks at Hawkins are reading this, let me say that a case of cheezies, fresh from the factory, would really make my day, week, month, year life! Ahhhh, a fine cure for gardening-related aches and pains is the 44 we started back in February! I've been faithfully swirling it for the last month and it was finally time to strain it and give it a try. It's definitely a liquer, but not as sweet as we were hoping. 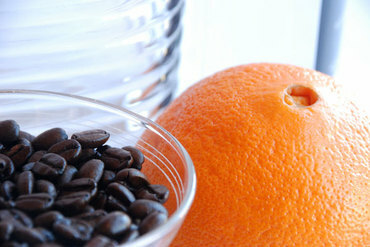 It's potent stuff and tastes predominantly of orange peel, with a backnote of coffee. And isn't it a gorgeous colour? It's good on it's own, but mixed with some Baileys Irish Cream? Heavenly. 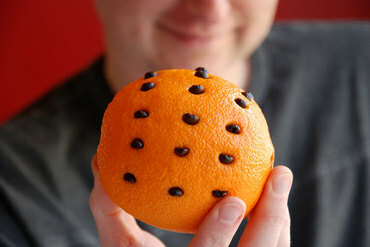 I'm also looking forward to trying it with hot chocolate or coffee. Maybe with Kahlua to add some sweetness and up the coffee taste? Mmmm...poured on ice cream. That would be good too... I've had more drinks in the past 2 days (4) than I've had all year. Yay for 44! David has a deep and abiding love for the sweet-but-not-too-sweet juice of blood oranges, and for the brief time in late winter that they're in season we have a lot of them at our house. What could be more surprising than to cut through the blushed orange skin to reveal a heart of darkness? Flesh the colour of rubies drenches the cutting board in a liquid that bears more than a little resemblance to blood and tastes deeply of sweet citrus, but also with dark notes of berry. Maybe the name and the Texas Chainsaw-type mess they make is why they're not very popular and are increasingly hard to find in the stores. Who wants to think about blood when they're eating? 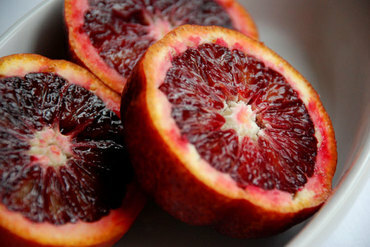 Hopefully the marketers won't get their hands on blood oranges and rebrand them into something more mundane. Part of their appeal surely lies in the name. Can you feel dangerous eating citrus? Should you? A no bake cookie with a chewy candy texture, these chocolate candy cookies are a nostalgic favourite of mine. I can remember barely being able to pay attention in school when I knew I had one waiting for me in my lunch, carefully wrapped in it's square of waxed paper.They don't need the candy eggs to be delicious, it's just a fun springtime thing to do! 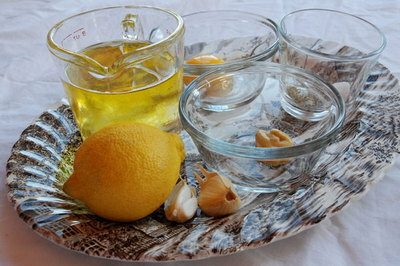 Put the following ingredients into a pot over medium to medium high heat and stir to dissolve. Make sure your pot is big enough to allow for the mixture to boil and bubble up. Bring the mixture in the pot to a boil and allow to boil, stirring occasionally for exactly 5 minutes. Remove from heat and stir in 1 teaspoon vanilla carefully, as it will sputter a bit. Quickly stir in the oatmeal and coconut and mix until everything is uniformly chocolatey. 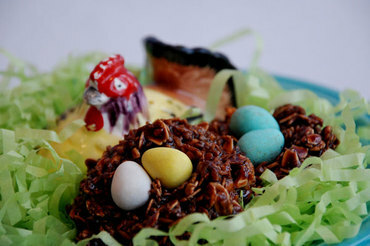 Working fast before the mixture starts to firm up, mound it onto waxed or parchment paper, press candy eggs or jelly beans into the top to make nests if desired and then let the cookies cool and harden completely before removing from the paper. It makes about 30 golf ball sized cookies, but you can make them as large or as small as you like. My Uncle Don has a lesson for you all that he learned many years ago - do not attempt to make candy cookies with the plastic spoon you get from the Dairy Queen, but if you do and the spoon dissolves into the cookies, you can still probably feed them to your little sister without lasting damage. Who Needs the Easter Bunny? 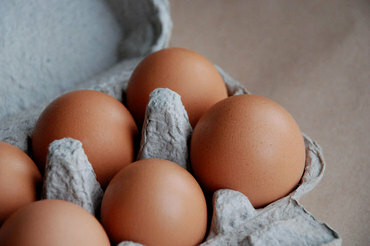 I surely don't when I get such beautiful brown eggs straight from a happy chicken via my organic box delivery service. They may sometimes send me things I'm less than thrilled with, but the eggs never disappoint. Aren't they gorgeous? 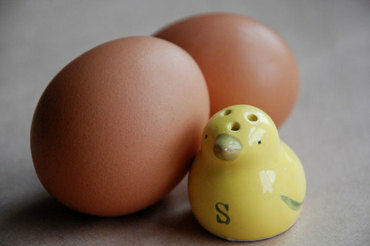 The service uses different local suppliers all the time, but this week the eggs were especially nice. Huge, incredibly fresh, with giant yolks of a deep sunflower colour and lovely sturdy deep brown shells. I just want to hold one and run my fingers over its curves all the time. There is just something primal and satisfying about cupping a perfect egg in your hand. 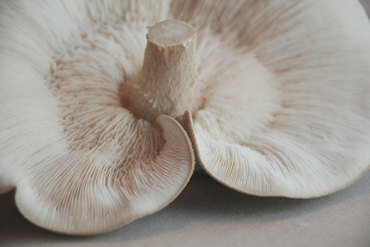 I know that one mushroom post was more than enough today, but when I cut the shiitakes off the block I was really taken with how beautiful the undersides of the mushrooms were. I just had to photograph them before they were sliced and went into the pan. My seeds may be struggling, but I grew these gigantic shiitakes! I let them go a couple of days too long, just to see how enormous they could get, but I'm sure they'll still be tasty alongside tonight's dinner, fried in butter with thyme and garlic. The biggest one is close to 7 inches across and very alien-looking. I know they would have been tastier smaller, and next time I'll harvest sooner, but there is just something so fascinating about growing something that grows so fast you can almost hear it. Does this fascination with abnormally huge food mean competition pumpkin farming is in my future? 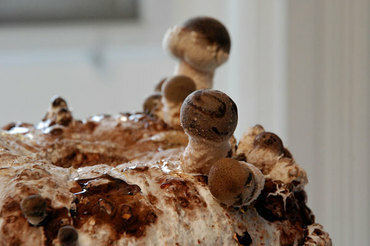 It's day nine for my shiitakes and there's been a lot of movement lately. You can definitely see growth every day. 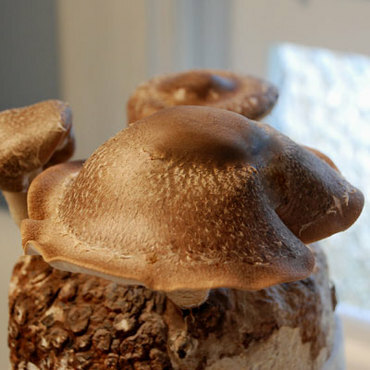 I HATE to admit this, but always buying my mushrooms in the grocery store has kind of insulated me from how...creepy...mushrooms are when they're starting to grow. Kind of like mold - bumpy and fuzzy. 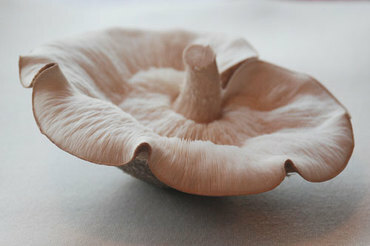 It's not going to stop me from slicing off those tasty shiitakes and frying them up with some butter when they're ready! Yep. I MADE marshmallows! Go me! Awesomely delicious. For some reason they've always intimidated me, but I DID IT. Maybe not a project for beginners, but if you can follow a recipe closely, not get distracted, wrangle a candy thermometer and deal with the tedium of 15 straight minutes of using the electric hand mixer (if you don't have a stand mixer) you can do it too! The recipe was from an old Martha Stewart magazine, but I'm sure it's on their website too. I'm pretty excited about the 'shmallows, but now I'm thinking about how to take them to the next level... drop them in hot chocolate? toast them? dip them in chocolate and roll them in stuff? s'mores? Oh, the possibilities! 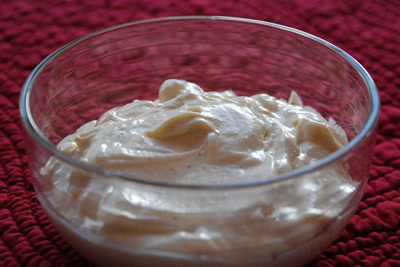 I'm sharing the instructions for aioli because it's impressive and so very easy. You will spend far longer learning to spell aioli than you will making this recipe! Ignore the insane amount of fat in this and enjoy it on special occasions. Dip stuff in it, smear it on sandwiches - you'll like it, I promise, and Vampires will give you a wide berth. No so much about the garlic? Leave it out and you've got some to-die-for homemade mayonnaise. Yes, that's right you can MAKE mayonnaise! I suppose since it's got a raw egg yolk in it I should warn you to only use the freshest eggs and it might not be appropriate for the elderly, young children or the knocked up. Through the little hole in the top dribble in the oil very slowly as the machine is running. In seconds you will have a thick, creamy decadant sauce. 5 minute magic, and won't people be impressed? Purple. Hairy. Gnarled. My first thought was "Why have they sent me a brown paper sack of alien hemorrhoids? 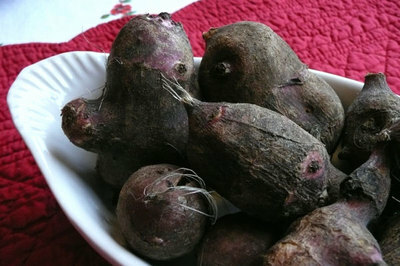 ", but when I read the packing list I figured out that they were Jerusalem artichokes, AKA sunchokes. I had no idea what to do with them, so off I went to consult Google and found out that they aren't an artichoke and they don't come from Jerusalem and that you use them like a potato. I decided on a straightforward cream of Jerusalem artichoke soup with bacon. Can't go wrong with bacon and cream, right? Well, maybe you can. The Jerusalem artichokes had the texture of a water chestnut when I was peeling them and didn't smell at all, but as they started to cook in the stock with the onion and thyme they started to REALLY smell like artichokes. REALLYREALLY. I like artichokes, but maybe this was too much? The soup is done now and the cream mellowed out the very assertive artichoke flavour some, but I don't even know if adding the bacon garnish will make this something I'm going to like. And Jerusalem artichokes are also known for giving the diner large amounts of sometimes painful gas. What a charming vegetable. Would reporting back after dinner be too much information? Although not Catholic, any excuse for a massive pancake feed is good enough for us, so Happy Shrove Tuesday! I won't go so far as to say that pancakes are my new religion, for fear of lightning strikes, but they sure are tasty and worth getting up early in the morning to make very occasionally. Chocolate chip pancakes were David's request and I decided to toss in some orange zest because when isn't orange and chocolate a good combination? 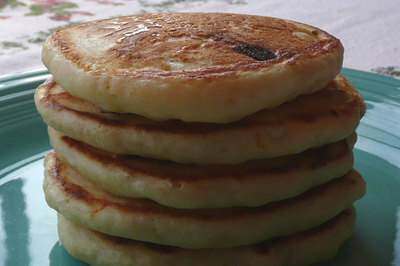 David thought they were great, but I wanted them to be a bit more pancake-y and plain. I don't think I'll be doing the orange thing again even though it was good, but the chocolate chips were a nice addition and they reminded me of a very romantic chocolate chip pancake breakfast David and I had in Seattle when we were newly dating. The whole world seems to be all about cupcakes lately. Whatever happened to muffins? 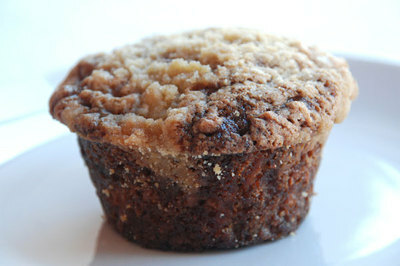 I'm not talking giant coffee shop cupcakes-in-disguise muffins, but real, made at home, filled with goodness muffins? They may not come in colours like pink, but they're still pretty darned great. I made some apple streusel muffins recently and they were delicious and you could eat them for breakfast without feeling guilty or even a bit queasy. I just want to do a shout out for muffins - you don't need frosting to be awesome! David thinks that having an at-home wife has a lot of benefits, including being able to phone or email in a "Code Brown" at any time. On the very worst of no-good, horrible, soul-shriveling days, when only chocolate cupcakes will help, David can say the simple words "Code Brown" and I'll know to have cupcakes and sympathy waiting for him when he gets home. There has only ever been one Code Brown so far, but he just likes knowing it's always an option. Today didn't end up being that kind of day, even though it had the potential. Todays cupcakes are just your basic "I love you 'cause you're great and I like to see your pink cupcake smile" cupcakes, but I used the Code Brown recipe because it's the easiest thing out there (yes, as easy as a cake mix) and it only makes between 8 and 12 cupcakes (depending on how big you like them). David is the only one who eats them, so any more than that would just be EXCESSIVE. Today I made 8 giant cupcakes with raspberry frosting and sprinkles, because sprinkles are just FUN. 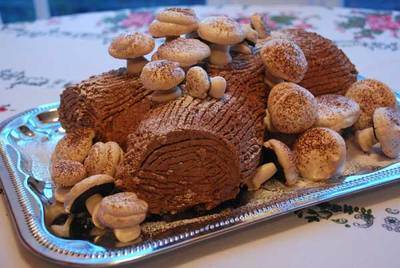 The Christmas Eve project this year was a lovely and delicious Buche de Noel. 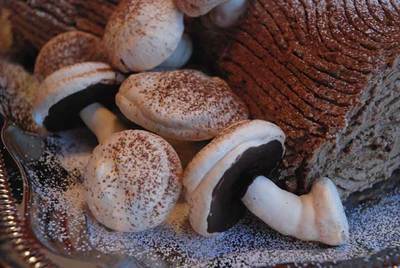 A chocolate sponge cake rolled around a rich but light white chocolate mousse and then frosted with mocha buttercream and decorated with charming meringue mushrooms made by David. Yum! I moved my table right up against the big kitchen window to take advantage of every beam of watery winter sunlight that can make it through the fog and drizzle. It's proving impossible to keep the cats off it (who can blame them, really?) so it won't last long, but while it does it's my favourite place for a cookie break and some listmaking. Christmas is a time for traditions and I'm the only remaining family member who can still make perogies, so it comes down to me to provide this starchy treat for our holidays. I've always made perogies - I learned it from my Nanny and from Sophie, my Great Auntie, who learned it from their Mother, the knowledge stretching back in time in an Eastern European eternity, when a sack of potatoes and a sack of flour had to feed a family through the winter. 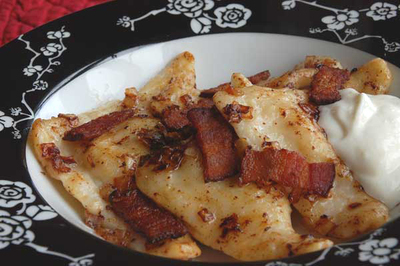 Perogies are heavy and stodgy and often just a little greasy and they're almost guaranteed to give you a stomachache, but if it's a taste of home and childhood and feasting and good memories, then you just NEED them. I'm sure you've got foods like that too. Of course I learned how to make perogies without a recipe, but a few years before my Nanny died, we made perogies together and for once we stopped chatting long enough to see what our hands were doing, and we wrote down the recipe and now, through the miracle of the internet I'm going to share it with you! First, start with the filling, which is just mashed potatoes with a little butter and lots of salt and pepper. That's right. Mashed potatoes. You can add onions or cheese or bacon or anything else you want to it, but at it's most basic and satisfying, it's just those three simple ingredients.You can use leftover mashed potatoes, but make sure they are extremely thick and haven't been thinned out and whipped up too much with dairy. The method is the same as making any homemade pasta. Make sure you have a large surface to work on. I use the kitchen table, covered in a plastic tablecloth. 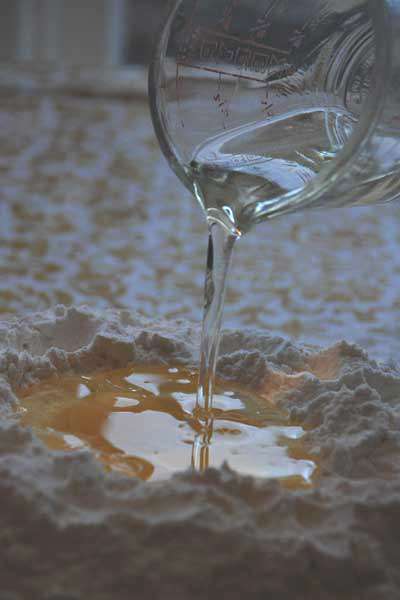 First make a pile with your flour and salt and make a large well in the middle. Into the well , crack the eggs and add the oil and a little bit of the water. Using your hands (or a fork if you insist) mix the liquid ingredients together and slowly start pulling in the flour from the sides of the well and continue adding water until you've got a big sticky gloppy mess. At this point knead the dough for a couple of minutes until pliable and smooth. Wrap the dough in plastic wrap and set aside to rest for about 30 minutes. If you try and roll it out right away it will spring back on you and be very frustrating. If it's too springy when you go to roll, just let it rest for awhile longer. 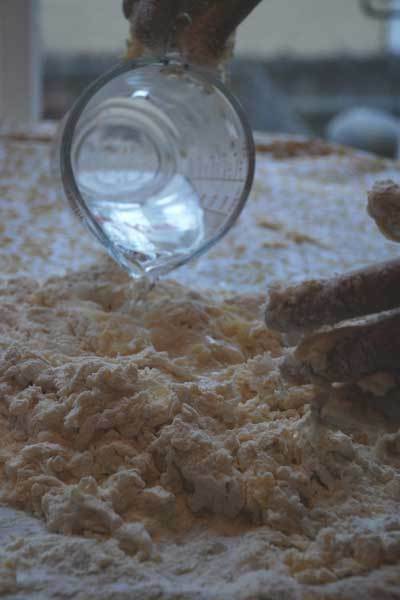 Then, on a large well floured surface, roll out the dough thinly. Have patience, this will take some time Once the dough is rolled, cut it into squares. How big? How big do you want your perogies? Dainty little cocktail sized ones or hungry family sized ones as big as your hand? That's how big to cut them. Take one square in your hand and stretch it to further thin it out and to make a more square shape if you cut it wonky like I always do. Be careful not to get it so thin that you get a hole. If this happens all the filling will boil out during cooking. Put a dollop of potato in the centre of the square and use a little warm water on your finger along the edges of the dough to act as glue. Pull up into a triangle and pinch the edges together FIRMLY. 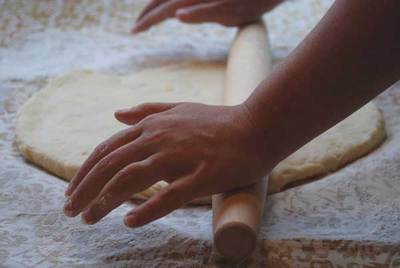 The dough must seal dough-to-dough - if there is potato at the edge it may not seal. Make sure they are well pinched together, but beyond that it doesn't matter what they look like. Perfection is not the goal here. Big ones. Little ones. Goofy ones. They all taste DELICIOUS and by the time they are topped with onions and sour cream and anything else you like, no one will be able to tell them apart. At this point, the perogies may be frozen for cooking later. Lay them out in the freezer on a parchment or silpat lined tray until hard and then put them in a bag. To prepare them, do not thaw and prepare as below but adding some extra time to the boiling. To finish fry some bacon until crisp (not necessary, but delicious). Drain the bacon and pour off most of the grease. Add a little butter to the pan (yes, bacon fat AND butter) and fry some diced onions slowly until well browned. Meanwhile, bring a large pot of water to the boil. Drop in the perogies one by one. Be gentle with them as they are quite delicate as they cook. When they come back to a roiling boil start timing them. As a general guideline I'd go with somewhere around 20 minutes. Shorter for small ones, longer for big ones. Shorter if you're just boiling a few, longer if you're doing a big pot. Take one out and cut it in half to check. 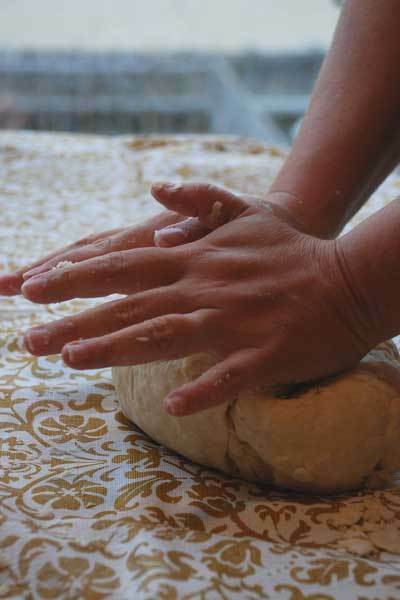 The best way to check is to eat it, of course, but you can also just look to see if the dough looks cooked through or if there is a darker, starchy, uncooked dough layer in the middle. When done, drain the perogies gently and put in the pan with the onions. Roll them around in the onions/butter for a couple of minutes. Some people actually fry them until crispy, but for me it's just about getting a nice flavour layer on them. You can also just put the onions on top. Then add your bacon and sour cream and eat! 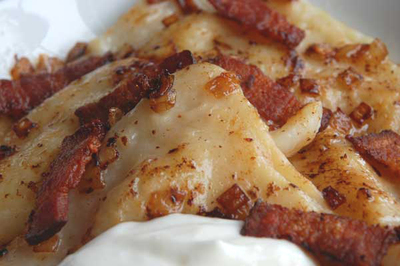 Some people consider perogies a side dish. I'm not one of those people. As my Nanny was dying, I remember sitting by her hospital bed and looking at her hands while she slept. Her hands were like pale birds on top of the covers, and I thought about how much I would miss her hands when she was gone. I thought of all the things those hands had done for me and how much they had taught me and how those hands were often the only ones that could comfort me, even as an adult. At that moment I realized for the first time that her hands were my hands. Physically, although separated by many years they looked the same - tiny and round with short, slender fingers. But beyond how much they looked like hers, my hands also held the memories of everything we had done together. One of the saddest parts of having someone you love die is that for years afterwards you slowly lose them, piece by piece. But I still remember my Nanny's hands and how it felt when she held my hands in hers. I remember her hands most at the kitchen table, making food for her family, or holding a cup of tea as we talked. 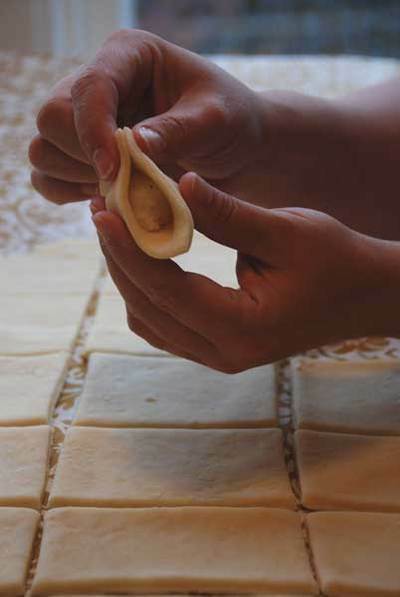 I like to see these pictures of my hands making perogies and know that who I am today and all the things I can do is my Nanny's legacy. She'd be happy.